The rise of China is the big international relations issue of our time. Unsurprisingly then, various solutions have been suggested to the strategic concerns China creates for Australian defence. In a rather broad sense, three alternatives are emerging. The most recent is a ‘defence of Australia redux’ proposal by two eminent Australian strategic thinkers, Paul Dibb and Richard Brabin-Smith. They see a darkening strategic landscape where 'for the first time since World War II, we face an increased prospect of threat from a major power.' They worry not just about China but also Indonesia and its vulnerability to Islamic extremism. Their solution is for Australia to develop a competent anti-access/area denial (A2AD) capability. If the Chinese A2AD approach can keep the Americans at bay, the argument goes, then maybe we can do the same and keep a potentially hostile China or Indonesia at arms length, or at least deter them. The ADF force structure under this strategy would stress air and naval forces rather than a larger army. The second approach is an ‘all the way with LBJ’ strategy. 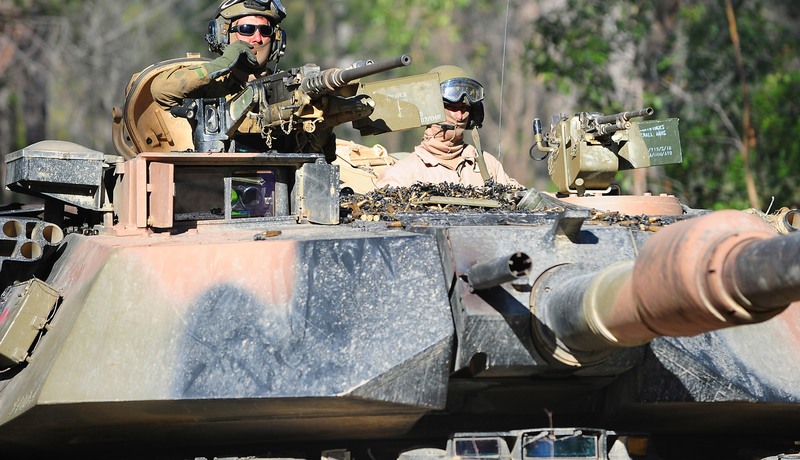 Stephan Frühling, in a defence industry paper, argues that Australia’s defence strategy should be mainly to supply a suitable piece of real estate from which American forces can operate offensively. The ADF’s primary task then becomes defending the Australian base area, providing an unsinkable aircraft carrier for (probably permanently based) US air and naval forces. Stephan’s argument grows out of his assessments of the hard realities of operating and sustaining the ADF in a time of large-scale conflict between great powers. In a China war, there would be considerable potential for escalation away from North East Asia and deep into our region. We might get badly damaged as a result. So practical military matters suggest Australia would be well served by getting very close to the US. Indeed our strategy would be simply to support the American strategy. The ADF force structure in this case would stress interoperability with US forces. The third approach is a ‘forward defence with a twist’ approach. Between Australia and China are numerous large and small Souteast Asian countries, many with concerns about falling into China’s sphere of influence and losing their independence. China has been steadily building up its influence among states closer to it, using economic statecraft to help keep in power those with a favourable view of China in power, and to keep others out. Australia’s strategy in this approach would be to work with like-minded regional nations to strengthen their resilience in the face of Chinese assertiveness. This would not just be a military strategy but a more comprehensive approach with economic, diplomatic, political and social aspects. The ADF force structure in this case might stress complementary with Southeast Asian forces. Each of these three approaches - ‘defence of Australia redux’, ‘all the way with LBJ’ and ‘forward defence with a twist’ - have similar problems. Firstly, none of the three has yet been turned into a grand strategy that articulates the better peace it ultimately seeks. The intent of a grand strategy is to try to address a particular strategic problem, and how our circumstances need to change in a way that resolves the problem; a better peace then results, even if only from our point of view. All three approaches undoubtedly seek a better future but none articulate what that future will be. They each need to spell out the improved strategic situation Australia will be in if their strategy succeeds. A counter-argument for the ‘defence of Australia redux’ approach is that it focuses on risk management, in which the focus is simply to limit damage if a foreseen bad event occurs, not attempt to make a better post-war future. This is avoiding the issue, though. The big question for each approach is, how would Australia be better off by adopting it? What is the shape of the peace that results if the proposed approach succeeds? Secondly, all three approaches are rather narrow. China looms large today not just as a potential threat but as a close economic partner. None of the approaches reconcile the tension between economics and defence. You cannot avoid the inconvenient fact that funding the future ADF relies on good economic growth, and to a considerable extent this relies on China. Thirdly, the three approaches take a somewhat superficial glance at our region. In the ‘defence of Australia redux’ and ‘all the way with LBJ’ approaches, there is a leaning towards a neo-realist perspective where only great powers count and all others can be safely ignored. On the other hand, the ‘forward defence with a twist’ approach tends to group regional states into those ‘captured’ by China and those not. However, the internal domestic circumstances of the various states in each group are more complex than a simple boxing suggests. Some states may move between groups depending on the situation and the incentives. Our region is complicated; the various large and small states cannot be easily lumped together without losing some nuance and sophistication. The three approaches each need greater granularity to give them improved explanatory power and plausibility. Fourthly, the big issue of our time might not be the rise of China but instead the vanishing of America. Some think President Trump has adopted a withdrawal doctrine where America leaves the rest of us – or at least our region - and goes home. Our happy conceit that the Trump Administration is a short-term phenomenon might be misplaced. The Administration may run two terms and be replaced by another with a similar outlook. America may have changed direction for the long term. The three approaches do not consider such a possibility and so lack robustness. Lastly, it might seem attractive to simply combine all three approaches. Perhaps Australia does not have to choose? Americans made the same mistake on the eve of the Iraq invasion; they could not fight and win in Iraq and Afghanistan simultaneously, even given their great wealth. For Australia, a similar caution should apply. Trying to do three different things risks strategic incoherence and spreads scarce resources thinly. For example, in the ‘all the way with LBJ’ approach it makes sense to have land forces fighting in the Middle East, including if a war with Iran eventuates. But in the other two approaches this would be unwise. For the ‘defence of Australia redux’ approach, it would mean diverting funding from building up our air and naval forces. For the ‘forward defence with a twist’ approach, it would divert attention and resources away from our region. These three defence approaches remain works in progress, albeit each resonates with Australian defence thinking from previous times. The rise of China means the need for contemplating alternative defence approaches is unlikely to go away. We will need to keep thinking. Photo by Flickr user DVIDSHUB.